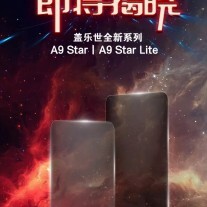 Well, that clears it up – leaked posters clarify which phone is the Galaxy A9 Star and which is the A9 Star Lite. And the posters provide launch info, including date and price. The Samsung Galaxy A9 Star is the SM-G8850, the one with the dual camera in the corner. It will cost CNY 3,500 ($545/€465) and pre-orders will run from June 7 to 14, sales start on the 15th. And there’s going to be a promo until July 10 (which seems to involve 10,000 limited edition JBL headphones and 15,000 Samsung microSD cards of 64 GB capacity). 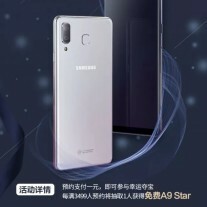 The Galaxy A9 Star Lite is tucked into the bottom left corner of the second image and earlier we mistook it for the Galaxy A6+ (2018), which has the same overall design – the centered dual camera, the antenna lines, even the Blue color. Indeed, there's talk that the Star Lite will sell under the name Galaxy A6 in China. 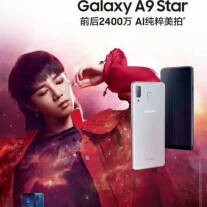 The second poster also mentions that the Galaxy A9 Star features 24 MP cameras (front and back) with AI features. Samsung Vietnam already has a page for the SM-G885F/DS – a Dual SIM A9 Star. Next week should bring more details as the launch draws near.